Franco-Portuguese Didier Gomes da Rosa has been unveiled as the new coach of the Guinean champions Horoya, as he signed a two-year deal on Wednesday. The 49-year-old replaces Frenchman Patrice Neveu, who left the club by mutual consent on Tuesday. 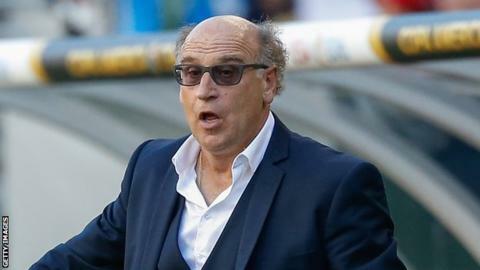 The former Guinea coach left the club just three days after guiding them to the African Champions league quarter-finals. Horoya have not explained why Neveu's tenure ended after just five months. Gomes will begin work with the club on Thursday after being unveiled by club president Soufiane Souare. "We want to develop local expertise, which is why the coach said he will work with you (the club), especially with his assistant," Souare said. "We must not hide anymore, if we want to go ahead in the Champions League. "Things are different now, we all have to work to develop this club. It's up to you to prove, everyone in his area of expertise, that what he does is good for improving Horoya. "We have targets in front of us, the league championship, the national Cup and the Champions League and we be successful by fighting hard for results." The new coach has called for the club to work together to achieve their goals. "I really like working with the locals, since they are the ones who can give us information on many players. I always come one hour before training starts," he said. Neveu, who coached the Guinea senior national team from 2004 to 2006, was only in charge of Horoya for five months and won the Guinea Super Cup. His successor Gomes is no stranger to African football as he had been in charge of clubs in Rwanda, Cameroon and Algeria. He won league titles with with Rwandan's Rayon Sports FC in 2013 and with Cameroonian club Coton Sports de Garoua in 2014 and 2015. Coach Gomes also won the Cameroonian cup in 2014 with Coton Sport and led them to the the semi-final stage of the Confederation Cup that year. He then moved to Algeria to manage CS Constantine in 2015/2016 season and later JSM Skikda.